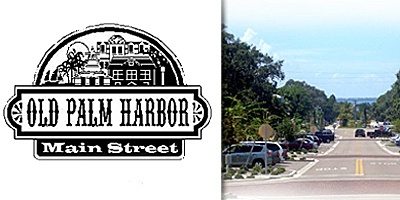 Palm Harbor is located on the gulf coast of Mexico in upper Pinellas County, nested between Dunedin to the South and Tarpon Springs to the North. Early settlers called it Bay St. Joseph, after the original post office, and a few short years later it was renamed Yellow Bluff! (Why exactly, I have yet to learn!) One early resident, Illinois native J.C. Craver, arrived in 1877 after his physician recommended a warmer climate to treat his tuberculosis. According to the Palm Harbor Historical Society, Craver built his first cottage on land owned by Walton Whitehurst - and Craver called it Limetta Farms. He began fishing, farming, ranching and harvesting timbers on the densely forested acreage between Yellow Bluff (an area that is now Ozona) and Lake Butler (later renamed Lake Tarpon). In 1883, Craver received a homestead for 160 acres and opened a general post office and store near the present day intersection of Tampa Road and County Road 1. After the Yellow Fever epidemic hit our Florida shores in the late 1800s, the name Yellow Bluff was scratched and was once again renamed - this time to Sutherland. The railroad came through during this time, bringing tourists. The area quickly sprouted two spacious hotels, the larger of which became Southern College in 1902. Sutherland was thought to be named after Duke of Sutherland, who visited these parts after landing at Tarpon Springs in 1887. Local pioneers insist that Sutherland is just a shortening of Southern Land and Development Company, the group which originally platted the community in 1888. Its main industries were cattle and citrus farming, the latter of which is still celebrated today each April at the popular Palm Harbor Citrus Festival which began operations in 2009. Sutherland was thought to be named after Duke of Sutherland, who visited these parts after landing at Tarpon Springs in 1887. Local pioneers insist that Sutherland is just a shortening of Southern Land and Development Company, the group which originally platted the community in 1888. The name was changed to Palm Harbor in 1925. It's got a much sweeter ring to it, doesn't it? :-) Currently Palm Harbor is home to about 64,000 full-time residents and is one of the largest unincorporated communities in Pinellas County. If you have questions or are considering relocating to the area, feel free to call or text me at 727.366.0324 or contact me (Julia) here. It's been my home turf since 2004 and I would love to share it with you! © 2008 -2019 Julia P. Fishel PLLC All Rights Reserved. All material is owned by and all rights are reserved by Julia P Fishel PLLC. Content may not be copied, reproduced, transmitted, distributed, downloaded or transferred in any form or by any means without Julia P Fishel's prior written consent.